Get Your Custom Logo Printed Pizza Boxes – Wholesale Custom Logo Printed Pizza Packaging Boxes Made in Custom Shapes, sizes, and layouts. We offer quality and error-free packaging services with free shipping in all USA. 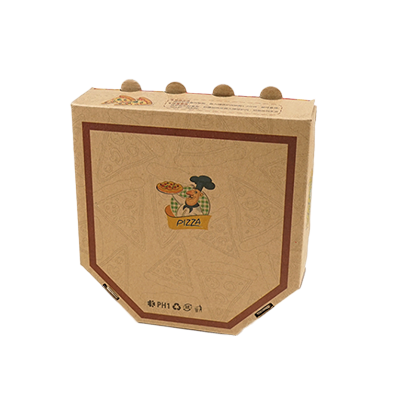 Packaging PAPA offers attractive customization for custom logo printed pizza boxes. You can have them crafted in favoured shapes, sizes and colours. Your logo, business’ name and contact details on the custom printed pizza boxes would play a phenomenal role in client retention. Pizza food chains use custom boxes for delivering and taking away pizzas. The quality of the custom printed pizza boxes is crucial for retaining the heat and freshness of the pizzas. Designing a premium pizza box requires professional expertise. Packaging PAPA is a renowned printing company that has been gratifying the packaging needs of thousands of individuals and businesses worldwide. The commitment to deliver superior services has earned us commendation from thousands of satisfied customers. Remarkable Printing: Packaging PAPA is preferred because of its high-tech digital and offset printing. We strive hard to make sure that all our finished products are unrivalled in quality and design. Turnaround Time: Packaging PAPA takes pride in providing its customers with timely printing and shipment services. Our production team makes sure that all the orders are printed before the deadlines. Free Shipping: Our free shipping services for packaging boxes are available all over the US and Canada. Looking for a creative custom printed pizza box to deliver your lip-smacking pizzas? Packaging PAPA has numerous interesting options for you. 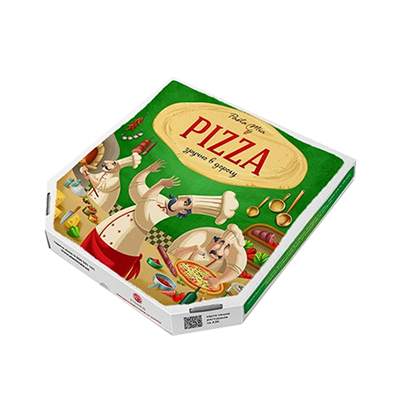 Avail our Free designing Services to have various templates’ design choices for the custom logo printed pizza boxes without any die cut and setup cost. Our accomplished graphics team will provide marvellous artwork preferences complying with your specifications. We are aware of the strength of materials and quality inks for packaging boxes’ printing; therefore we make use of best stocks and inks. Eco-friendly Printing: Packaging PAPA is offering its venerated clients consumer environment-friendly packaging boxes. We utilize 100% biodegradable substances for printing. Custom logo printed pizza boxes are used by the pizzerias for delivering and handing over pizzas to the customers. These boxes serve as advertising streamers of a particular pizza chain; they are a source of reaching a wider target audience. Generally, cardboard and Kraft are used in the manufacture of printed pizza boxes. Cardboard material is printable and most of the boxes for pizzas that we receive are made out of it because the pizza providers deem it important to have their logos and contact information printed on the boxes. The CMYK/PMS color technique assures high quality image and color resolution of custom boxes for pizzas. Kraft pizza boxes are recyclable and cost efficient. A pizza box is made out of quality stock for safe storage and transportation of pizzas. The pizza chains attach their discount coupons to the delivery boxes. This marketing tactic proves really productive in heightening sales. Having a catchy and inspirational artwork for your custom pizza box adds to your brands’ popularity. Different pizzerias are making the best out of the pizza delivery boxes for endorsing their exclusive pizza flavors. Pizza hut is known across the globe not only for its palatable pizza flavors but also for the classic takeaway and pizza delivery boxes. Frozen pizzas are packaged in flashy boxes to make a striking impression on potential customers. Unique pizza boxes would earn you a distinguished identity among your competitors. Be creative and make your boxes for pizzas worth noticing with stupefying images and catchy content. If you have an appealing tagline, print it on your custom logo printed pizza boxes. 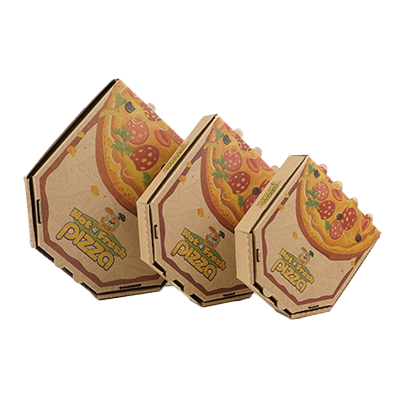 Interestingly shaped boxes for your mouth watering pizzas would make the customers fall in love with your pizzeria. For events like birthdays and Christmas pizza boxes with pertinent customizations can be printed. Get your food chain worthwhile acclaim with compelling custom printed pizza boxes!